I had an interesting email in my box today. What do you think? 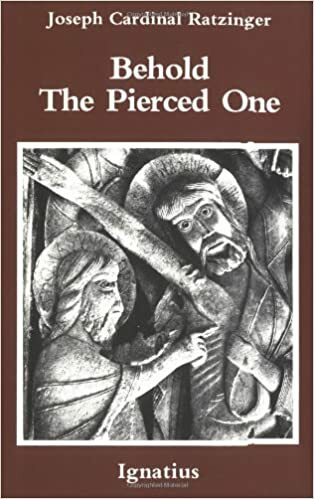 I’ve been reading through Ratzinger’s book “Behold the Pierced One“. [UK – HERE] In it, he addresses the issue of the prohibition of communion to the divorced and remarried (pp.94-98). Does this strike you as a more serious way to “accompany” sinners who are in “complicated situations” than simply telling them that they can receive Communion? This doesn’t give the impression that their sins are being overlooked or, worse, condoned. Also, it engages the powerful means of intercession which the Lord Himself praised. Today vast swathes of the “Catholic” people probably have a vague notion of what the Eucharist and Communion are. For many people today Communion is, I fear, the moment when the lady puts the white thing in your hand just before you sing the song. Getting the white thing means that you’re okay just as you are; you are affirmed in your you-yourself-ness. Hence, any suggestion to vast swaths, and to the priests who are not really guiding them, that it is perhaps better not to receive is met with disbelief and shock. What a challenge! “How dare you suggest that I’m not okay or that you don’t accept me just the way I am!” Getting the white thing before singing the song has taken on a dimension of belonging to a mutual self-affirmation club. The controversy over Communion for the divorced and remarried has far reaching implications. If those living in patently adulterous unions (or any other sinful state) can in fact receive Communion, then was Christ’s teaching about indissolubility … wrong? If it was wrong, if Christ could get that wrong, then is Christ really God? If Christ isn’t God, then the Eucharist isn’t Christ. If the Eucharist isn’t Christ, then what is Communion? Are we idolators? If the Eucharist isn’t what the Church has always said it is, then what is the Church? Who are we and what are we doing? The moderation is queue is, of course, ON. This entry was posted in "How To..." - Practical Notes, One Man & One Woman, Our Catholic Identity and tagged divorced and remarried, Joseph Ratzinger, St. Augustine of Hippo. Bookmark the permalink. 29 Responses to A serious Catholic way to “accompany” the sinner? To whom else could we go? For He alone has the words of eternal life. If anything, in our permissive modern culture today, we need more discipline, not less. Discipline is humbling – and we look around the world and are far stretched to find humility anywhere. One more clearly gets the insistence on the Mass as being a “supper” around a “table” with the Eucharist being just a symbol that one can flippantly flip into one’s mouth making the circuit…as well as the ferocious hostility toward ad orientem, confession, and proper homiletic practice, in short, any sort of Catholic liturgy that is non Protestant in nature. When a priest becomes just one giving you a pep talk on Sunday, someone who is a life coach sort of Oprah figure who starts things off with bad jokery and then adds in a few slice of life vignettes and healthy suggestions for your week, as in, any mindless morning radio or network tv show, “light news, sports and weather”, and a little entertainment over coffee…and sends you off not quite knowing what that was other than it was something about this person’s opinion about Jesus just as one considers this or that celebrity’s actions in the news which we call news and no longer mere gossip…then of course he is not going to want to offer a Holy Sacrifice, he is not going to want to be accountable and take responsibility for the salvation and sins of those he purports to “guide”, and he is not praying to Jesus, facing Him the Just Judge, together with us, as a fellow sinner who takes responsibility and goes before to plead for pray for and seek after the eternal salvation of our souls. He washes his hands of the difficult details and just suggests, if that, a few ethical guidelines in harmony with the culture and mores and fads and fashions of the day. If we follow his “advice” it is sufficiently veiled behind punchlines and silly anecdotes and a lot of hot air and nothing in a folksy style of priestly local celebrity to prevent any connection with the Last Things or the only really important things. And, as they have all decided there is no heaven or hell and penitents are not welcome, we need none of us have concern for our conduct even in a small community in which people are visibly and obviously harmed by our sin. Yes? Hmm. I don’t know if I would ever have the guts to fast from Holy Communion, if I am properly disposed to receive It, and especially if I sense my end approaching. There are some things the saints did that the rest of us should not imitate without seeking guidance from a reliable priest; this is probably one of those. “If those living in patently adulterous unions (or any other sinful state) can in fact receive Communion, then was Christ’s teaching about indissolubility … wrong? If it was wrong, if Christ could get that wrong, then is Christ really God? Exactly. A crisis of faith. This is going to be the natural result if the formal correction does not happen. If these tenets of the faith are questioned, everything can be questioned, and suffering Catholics and more souls going to hell will be the outcome. What is reigning now is chaos and confusion, which is not of God but of the evil one. We also see division so sharp it is likely to lead to more than just a de facto schism, which we already have, but a real one. We may truly get that anyway, but we prefer it by far to the unchallenged madness of what we are witnessing. Perhaps I’m missing something, but if we can offer communion to adulterers, and soon maybe heretics, is there any serious sinner who ought not to be able to receive it, in order to avoid discriminating against one type of sinner, depriving them of the Body of Christ and the concurring graces? My thoughts ask why not Satanists? This wonderful and exactly what we need to know. I had this idea–to voluntarily refrain from Holy Communion in solidarity with those who cannot receive for whatever reason–myself. I had no idea Ratzinger had this idea earlier. 1. Voluntarily refraining from receiving Communion at least one Sunday every month, making a spiritual communion instead offered for those who cannot receive Communion for whatever reason. 2. Attending at least one extra daily Mass during those weeks in which you refrain from receiving Communion on Sunday. Offering that reception of Communion, again, for those unable to receive. And I’m afraid it was the same for many even before Vatican II. Those in irregular marriages who want to receive may, perhaps, value the Eucharist just a teeny bit more. Unless I’m mistaken, St. Mary of Egypt took Communion only twice: after her conversion and then before her death. When I have not been in a state of grace and refrained from receiving, I have experienced a powerful feeling that I cannot describe. Not an indwelling of grace of course, but an almost joyous feeling that God is pleased that I knew I was not in state to receive and did not. I don’t know if that would continue if I was in a longer term situation such as a civil marriage while still sacramental ly married…but I think it’s possible. I received my religious education from the sisters in the 1950s. We learned about the Real Presence and the Holy Sacrifice of the Mass. God bless them. In these times of elevated hazard (if not at any time), for a well-disposed Catholic unilaterally to “fast” from the Blessed Sacrament would seem ill-advised. Better by far, I should think, would be for parishes to restore the preconciliar practice of having at least one Mass per Sunday — say, the 5:30 p.m. “catch-all” — at which Holy Communion is not distributed to the faithful at all, thus diminishing any perceived stigma. This is ludicrous. I do not get the white thing and then sing the song. I get the white thing WHILE I sing the song. Silly question, probably, but instead of refraining from Holy Communion, why not receive It for a relative in purgatory? You can see the connection between the issues (if….then…..if ….then). Do you have a plausible explanation why His Holiness can’t see it? This is brilliant. Taught me much. Thank you Card. Ratzinger, thank you anonymous correspondent, and thank you Fr. Z. Odd coincidence: I just fasted from the Eucharist today. I went with my wife to a cousin’s funeral mass that was scheduled very early in the afternoon, just after lunch at 2:00 PM in the magnificent Sacred Heart basilica of Marseille. The church was full. Though my lunch took place much earlier than 1 hour when the priests began distributing Communion, I decided not to line up because I could still have the taste of the meal and the coffee I took immediately after, so this gave me a feeling of unworthiness and led me to refrain. I made a spiritual communion instead . Many attendants had not my scruples. It does seem the opposite problem that what was facing St. Pius X when he promoted frequent Communion and that a large number are, if not outright sacrilegious, of dubious disposition. How could one doing daily or even weekly Communion be as disposed as those who consulted with their spiritual director and underwent a sort of mini-Lent of the type when the average laic only received the Blessed Sacrament four to five times a year. Consider that the Poor Clares, by rule, communicated six times a year; the Dominicanesses, fifteen times; the Third Order of St. Dominic, four times. Even saints received rarely: St. Louis six times a year, St. Elizabeth only three times. St. Louis was said to have attended Mass three times a day, no less…. Over at Vultus Christi, had an interesting post on this topic a couple of weeks ago. The devil wants to trick those who are properly disposed into NOT recieving Holy Communion. Scrupulous people are especially prone to this. It gives Our Blessed Lord great consolating to be recieved by one who is properly disposed and those of us who are severly distracted during Mass but still in the state of grace can at least recieve as a sick person recieves a physician. Do you think you can do better without Jesus? Do you think you can love better without Jesus? Do you think you can be Jesus without Jesus? “Unless you eat my Body and drink my Blood you shall not have life in you.” Blessèd Imelda had a great lnging for Jesus. St. Pierre Julian Eymard, St. Thérèse and St. John-Paul II all encouraged frequent Communion. The whole point of why those in objective mortal sin can not recieve Holy Communion is because it is sacrilege. It objectively desicrates the Body and Blood of Our Lord and condemns the sinner to a deeper place in Hell unless he gets to Confession. This is the Truth of our Faith. All this nonsense is just a religious version of a “too big to fail” mentality; where if enough of us are willing to ignore and so break from what is unambiguously good, for the expedience of getting whatever we want in the way we want it, then is anyone really culpable…just bend the teaching to fit the behavior. Everybody’s doing it, it must be right, right? Or at least I can tell myself that it can’t be all that wrong. Meanwhile, people continue to ask that stupid question about how something like Nazi Germany could have happened – as if it were something they could NEEEEVER do. Oh, you mean that thing where if everyone is doing it, it must be right? Yeah, that. “Accompany” the sinner– that’s what I used to do on Saturday afternoons when I drove my kids to confession. It’s because I know what it is to receive communion, and that such a fast would be incongruent with my vocation that I would never willfully choose to fast from receiving our Lord in such an intimate act of love. I will fast on bread, water and our Lord, or even just on water and Our Lord before I willfully choose to fast from that Heavenly consummation in order to “accompany” someone who chooses to remain in their sin and engage in adulterous relations with someone. If other people feel called to such fasting, let them go for it, but it’s not for me. Besides, I need all the sanctifying grace I can get. Hi Father. I am very pleased you have touched on this. It is good to know that I am not alone in this and in doing this for this reason. Some of us who are waiting to have stuff resolved… this is very much part and parcel. It is difficult to receive alone and easier to abstain together. Holy Mass has become the center of my life , and the Lord is the only one who is able to give my life a sense of direction each day. (I’m not talking about saintliness either – I’ve had to to frequently avail myself of the sacrament of Confession along the way . . . still do). But love for Christ in this Sacrament grows when it is fostered. And we can never rely too heavily on Jesus in Holy Communion – He is everything we need. But there have also been points in this journey where certain sins of an habitual nature threatened my relationship with our Lord in Holy Communion. In those circumstances I discovered the worst thing I could do, was stop attending daily Mass ; and the right, but most painful thing I could do was to attend daily Mass knowing I wasn’t going to be able to receive Holy Communion. In those particular situations , when two things began to converge (frequency of the habitual sin, and the frequency of receiving the sacrament of Reconciliation) I thought it best to take a step back to see what was happening . I could recognize in the distance a potential point looming in the future . . . just kind of hanging around on the horizon , where sin might actually intrude enough to prevent me from receiving Holy Communion on a regular basis. Sin keeps us from thinking clearly. It destroys or disturbs our inner peace. I thought it was important to remind myself of exactly what would happen if sin began to dominate in my life – without my thought being constrained by sin (ie abstaining from Holy Communion because not properly disposed or my peace being compromised by sin ) , ie. in a state of grace. It brought home the message both clearly , and uncomfortably. But it also strengthened my resolve against the habitual sins and exponentially increased my desire to received our Lord the very next day in Holy Communion. I don’t know if I would recommend this to anyone else , but I was happy to know the idea of abstaining from receiving Holy Communion when properly disposed – on singular occasions (isolated instances) is not a foreign one in the hearts of Catholics. Thanks a lot for posting about it Father Z.
P.S. I believe one reason sin never got to that point -of turning me away from daily Mass, is that I never gave up the daily recitation of the Holy Rosary. I let this involuntary fasting from the Eucharist form me and make reparation for my sins. I allowed the “pain of yearning” to prepare me for my first Holy Communion. During this time, I was fully aware that the annulment wasn’t a guarantee and we might face the decision of being in the Church, while not fully in as we would be unable to receive the Sacraments. Or, I believe that the option to live as brother and sister would allow us to receive the Sacraments, though we were young and just beginning a family. Fortunately, we didn’t have to make this choice, but I know that I would not have gone elsewhere. I want to believe that these are the sort of goodwill situations based on authentic conversion that the Church is trying to accompany, but I agree, we do not accompany in Mercy when we confirm others in sin. That would not have helped at all! I do now occasionally voluntarily fast from the Eucharist, but often there is an underlying reason-usually because I can’t get to a priest-then I offer it for the Church. I agree that the current state of knowledge of the faith by the laity and catechetical instruction by the clergy is poor. The priest in my current cathedral parish gives a homily every single Sunday that pretty much is a slight variation (tailored to the words of the particular lesson) of a single theme, i.e., that God loves you unconditionally. While he doesn’t say anything particularly heretical, I always think there is more to our faith that could be discussed in the homilies than just this one emphasis. There is rarely any call for repentence for our sins, maybe just the occasional gentle “there are times when we could do better” type of bromide. Never has there been any encouragement to use the sacrament of reconciliation, and lines at the confessional are conspicuous by their absence. At comunion time, however, one and all troop up to receive.